This morning, a little peruse through the needlework and embroidery bits from hither and yon that have come to my attention lately – to get you through your morning coffee! Let’s go for a little browse, shall we? A little bit of inspiration and historical reading to start us off! Back in 2015, I wrote a series of articles on different embroidered tapestries around the world. I love tapestry projects that bring whole communities of people around the globe together, in one way or another! In case you haven’t seen it yet, the Battle of Stamford Bridge Tapestry Project is worth reading about – and the embroidery, of course, is wonderful! If you’re a Francophile at heart – if you’ve spent your life dreaming of Paris in Spring – if you love embroidery…then here’s your opportunity for the needlework tour of your dreams! The French Needle is hosting a magnificent needlework tour in France in spring of 2018, and the itinerary looks dadgum tempting. It includes classes, too! I just found out, before writing this up, that they only have one spot left, though. If you want it – of if you just want to read about it and sigh a bit – grab it here! Embroidery Patterns – Fillings – Fun! Antique Pattern Library has added a fantastic edition on Latvian needlework (PDF link). There’s a spread of charted filling patterns in there that can be adapted to all kinds of needlework, from counted work to knitting. You might also notice the page decorations throughout the book – they’re excellent folk embroidery motifs! Another edition recently added: Selected Patterns from a Weaver’s Draft Manual. If you love counted work, samplers, and folk motifs, you’ll recognize this as a great resource for pattern development. There’s plenty of browsing to do at Antique Pattern Library – it’s by far my favorite rabbit hole! Over on the blog Opus Anglicanum, you’ll find a series of interpretations of medieval lettering in embroidery. She’s working her way through the whole alphabet, and it’s pretty fun to follow! There’s also a dragon stitch-a-long going on. Over here on Thistle Threads, they’re running a limited number of spots for an online class on making a 3″ stuffed peacock, using tiny flat braids (lacets) in the 17th century style of embroidered caskets. If you’re a children’s literature fan and you like the Laura Ingalls Wilder books and the history of beads and beading interests you, you might find this article on The Pioneer Girl Project website interesting. For fans of the era and the literature of Wilder, it’s a fun website to follow! Anna Scott has a lovely tutorial on string padding for embroidery over on her blog. And the project she’s using it on is pretty, too! If you like to listen to things while you stitch, you might check out Stitchery Stories with Susan Weeks, where “textile artists share their life in fabric and thread – embroidery, textile art, inspiration, techniques, disasters, and delights”! They produced a podcast at the beginning of August featuring Tracy Franklin that I really enjoyed listening to, and I’m steadily working my way through the others. The most recent episode is on the Battle of Stamford Bridge tapestry project. I’m excited to see Susan’s podcast library grow! I started another project. This is what happens when I can’t make up my mind what project to attack in any given day. I end up starting another one! I’ll sneak peek it to you next week. If you’re ready for fall stitching, keep an eye out – I’ve got a project coming out for your within the next couple weeks! Can’t wait to share it with you! I’ve coordinating with a thread source for a specialty thread pack just for this project, too. So that will be a fun release! Tutorials. I’m working on some! And I’ll be sharing them soon. There’s a jolly book review on the horizon. And I’ve proven myself a hypocrite – I’ll tell you how when I show you some beads and wonder with you about color. I’m keeping my eye on Irma this weekend – lots of family and friends in Florida – I hope you all keep safe! And that, my friends, is the current browse. I wanted to share more, but time is pressing, coffee is cold, laundry is calling, and I’ve got an appointment in half an hour! Gee whiz. Time flies when you’re having fun! By great coincidence I had also found the weavers patterns you mentioned here and have made a sampler pattern with it that I’m planning on sharing (for free of course) on my blog starting in January. The weavers patterns work really well in cross stitch! Yes, I think they’d make a great band sampler!! I really enjoyed the photos and video of the Battle of Stamford Bridge Tapestry. Thank you for sharing. Thanks, Ann! I’m glad you enjoyed it! I think it would be so much fun to be involved in a tapestry project like that! I really liked the Battle of Stamford Bridge Tapestry project, It’s so interesting and beautifully stitched. Oh if only I could afford Paris in the Spring looks really lovely. I’m looking forward to the future goodies you have for us new project, tutorials, book reviews and all sorts of wonderful things. 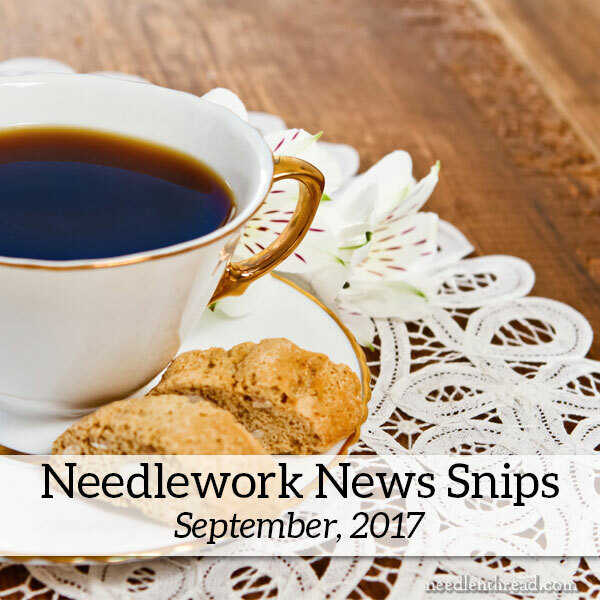 Thanks for sharing with us the September News Snips really enjoyed the browsing. I hope you have a great weekend. Thanks, Anita! I hope you have a great weekend, too! Is autumn settling in there yet? We were tricked into thinking it had arrived here in Kansas, but now we’re back to the heat! Good excuse to get housework done and then plug away on some needlework, I suppose! No it’s getting cold here but sometimes sunny but windy, rainy the normal September weather which I actually prefer, I can breathe and not get constant hot flushes. Thank you for sharing these resources. I probably would not have found them otherwise. It is wonderful to expand my horizons. Thank you for featuring our tapestry on your blog today. As project leader I would like to pay tribute to our designer and all the stitchers who continue to devote themselves to this project. Thank you for featuring our tap story on your blog today. As project leader I would love me to pay tribute to our designer and stitchers who continue to devote themselves to this project. Being of Latvian descent, I love the Latvian motif link. However, I have to wonder how old it is – I notice it is in both Russian and Latvian…. Thank you so much for mentioning the Stamford Bridge Tapestry, Mary, and including the link – it really means a lot to us! I’m particularly interested in the Medieval embroidery – is it in wool? and how are the individual items (artwork) transferred onto the whole piece, are they drawn freehand and then filled in? I’m a student of Goldwork and the technique is completely different and I am working on large frame on dining table, which takes over the whole area and my life, one project at a time, attend a class too. I’m impressed by the amount you get through and still manage a life! Are these community group projects? Thank you so much Mary for this wealth of sites to visit and their amazing and beautiful stories and stitching. I am truly grateful for such information. Your snips are always one of my favorite things.